Successfully Added Portable DVB-T Digital TV Player with Recording to your Shopping Cart. 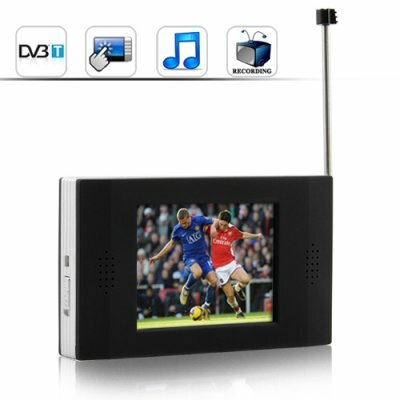 Portable DVB-T Digital TV player with a vivid 2.4 inch touch screen LCD, EPG (Electronic Program Guide) and TV recording functions. Watch television on-the-go like never before! If you love television, you can finally watch it no matter where you are! With the most powerful, most sensitive signal receiver of any device in its weight class, the CVEF-E83 DVB-T Digital TV player lets you receive beautiful, crystal-clear DVB-T digital TV signals anywhere you go: on the bus, in the car, at the beach, indoors at work, in meetings, in class, at the in-laws house, and in the bathroom. This new hot item gives you a crystal clear digital image for the best possible viewing and won't lose its signal no matter where you are and where you go. The CVEF-E83 comes with a variety of user function controls to allow you (the user) to maximize your viewing needs and pleasure. With the EPG, you can see the scheduling information for current and upcoming programming so you'll never miss out on your favorite television shows or sports matches again. Users can also record everything to an external 16GB TF card and watch it later directly through the portable DVB-T digital TV or transfer the file and watch it on their computer/laptop. The CVEF-E83 DVB-T Digital TV with Recording is in stock now, so order today and we'll ship it out tomorrow! Buy one for yourself or your friends and start enjoying TV everywhere you go. Even better, take advantage of our 12-month warranty and factory-direct price to outsell your competitors on eBay and Amazon. From your best source of the latest high-tech gadgets, Chinavasion. I see radio on this DVB-T digital TV player as well, but I can't get it to work? While there is an icon, this product does not come with radio functionality. No, however, you do not need a micro SD card to enjoy watching DVB-T television. The micro SD card is only if you wish to record TV shows or put MP3 files on it and listen to it through the CVEF-E83. Can I connect the E83 to the computer? Yes, you can connect it to the computer to charge it. No, you cannot transfer files to/from the micro SD card this way. You will need a card reader. Does this product come with a stylus pen? No, the touch screen interface responds quickly and accurately, a stylus pen will only slow you down. What can I say! This little device is amazing! I live in country South Australia and this TV picks up every channel perfectly. And contrary to the FAQs this unit can pick up radio - SBS, ABC, etc. Battery life is excellent too. The recording functionality is perfect, I can record a program to a my micro card and convert it to AVI and watch it through my DVD player. All I can say is buy one now! I was surprised by the quality of this tv,reception is better than I thought it would be. I can watch Sky Sports News on the bus without having to pay to watch it on my phone. If it had a socket for an external ariel it would be better- what I think someone should make is a neckband type ariel. Delivery is was quick,I am very pleased with this tv,and being able to record is fantastic.